Teach students to listen rhetorically and argue effectively. Streamlined and current, Everything’s an Argument helps students understand and analyze the arguments around them and raise their own unique voices in response. Lucid explanations cover the classical rhetoric of the ancient Greeks through the multimodal rhetoric of today, with professional and student models of every type. More important than ever, given today’s contentious political climate, a solid foundation in rhetorical listening skills teaches students to communicate effectively and ethically. 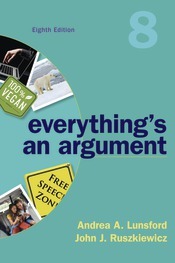 Thoroughly updated with fresh new models, this edition of Everything’s an Argument captures the issues and images that matter to students today. Also available in a version with a five-chapter thematic reader.